Food literacy is on the rise and Niagara Garage D'Or Ciders is helping with that, thanks to making ciders with reclaimed fruit. This post was sponsored by the Greenbelt Fund. What does that mean? I was paid to write about a topic of my choosing inspired by the most recent story published in The Toronto Star related to Ontario’s Greenbelt. The ideas, interviews and writing are my own. The Greenbelt Fund fact-checked all information, including numbers and statistics, about the Greenbelt in this post before publication. There’s a landmark on the other side of the Welland Canal that my daughter points out every time we drive by. “Fruit farm!” she yells from the back seat whenever we pass the shuttered Werner’s Fruit Farm stand on Lakeshore Road. She wants to stop at the red plywood hut and buy peaches, plums, apricots and raspberries, just like we did every week in the summer. Enter Killjoy Mom. “We ate all the fruit last summer. We have to wait for more to grow,” I say. She got equally excited on CSA pickup days this winter at Creek Shore Farms in Port Dalhousie. “We go see Amanda and Ryan? They give us carrots?” she’d ask every Wednesday when I picked her up from day care. At nearly three, she knows the names of most of the folks at our local food stops. Olivia also loves to help me water my community garden plot, too. And she stands next to me in the kitchen, taking on the important job of stirring, or raiding the utensil draw so she can pretend to whip up something of her own. I like to think I’m raising a food literate child, one who knows where our food comes from, and who will eventually get the hang of seasonality. But what about food literacy among adults? The generations once or twice removed from the farm aren’t doing so bad anymore, either. A recent feature in the Toronto Star tells how we’re getting better at putting a face on agriculture and making the human connections to food. More folks are making the trip to the farm stand to ask questions about their peaches, and to eschewing the disconnect available in abundance at the grocery store. It’s easy to get to know Niagara's farmers at local markets and the stands at the foot of their laneway. The northern tier of the peninsula is part of the Greenbelt, two million-acres of protected farmland and nature. Opportunities abound for each of us to have a list of beloved food landmarks. My favourite part of the feature was reading that Toronto Chef Guy Rawlings participated in an event called Trashed and Wasted, a public tasting of rescued and reclaimed food made by chefs, brewers and distillers. Niagara has a bit of Guy Rawlings in Brian Yeo and business partner Gavin Robertson. The duo are co-founders of Garage D’Or Ciders, a local craft cidery that unofficially launched last year with four small-batch ferments. Their Walken on Beaches peach cider was used making seconds that would have otherwise been left to compost or fetched little at market. Most exciting though, is Garage D’Or’s Reclamation label. It uses apples from abandoned trees, and crab apples from a tree on someone’s front lawn. Seeing unpopular or unfamiliar fruit like crab apples turned into hard cider is a thrill for me. For the past eight years, the Garden of Eating - Niagara has tried to get people to realize the value of urban tree fruit. My ultimate goal when I launched the fruit rescue group in 2009 was to get fresh produce to social organizations and people who needed it. But I soon realized that less common fruits like mulberries and crab apples were a tough sell. Thank goodness for Adam Hynam-Smith and Tamara Jensen of El Gastronomo Vagabundo, who turned mulberries into iced tea to sell from their food truck one summer. I don’t have the words to describe my gratitude to Chef Mike Gretzinger, who taught culinary arts to high school students in Niagara, and had his class can thousands of pounds of heritage pears for local food banks. And then there was the joy of convincing Great Lakes Beer in Toronto to use those same heritage pears to make beer two years ago. Together, they’ve all boosted food literacy in Niagara by showing people what can be done with fruit we’ve fallen into the unfortunate habit of deeming garbage. Here’s Yeo, a veteran of Niagara’s alcohol beverage production scene, in his own words about what Garage D’Or Ciders is trying to achieve. How did GDC come to be? About three years ago, I started toying with the idea of ciders and possibly a cidery. I fell in love with ciders on a trip to Northern France about 15 years ago and had always been disappointed with what was available to me as a consumer in Ontario. But also at this time, you were starting to see some good things happen in Ontario with respect to ciders. So the idea of taking this further started to become more of a focus. A little over a year ago, I approached a good friend and co-worker, Gavin Robertson, about the idea of making some small batch ciders, and the initial idea of what would become Garage D'or started there. What is the mission or vision for GDC? 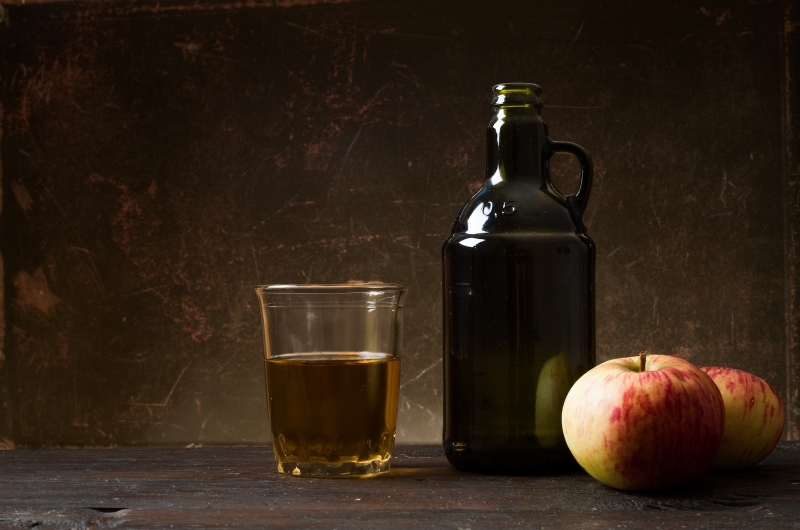 Ideally, it’s to create great ciders that will both please and challenge the perceptions of what Ontario cider can be. For us, it’s to respect the traditions of cider and cider-making, maximizing the best expression of the fruit that we can, and still push boundaries on the styles we produce. How much of a role do the harvests of orphaned fruit trees play in what you do? So far it’s been relatively small. We’ve only released four small batches of cider under the GDC name with one being from truly abandoned fruit (Reclamation). One was made with some seconds that were generously given to us by some friends (Walken on Beaches). This is something we hope to expand upon greatly this year. Why bother using this fruit? What's in it for you? I'm fortunate in my job that I get to spend a lot of time driving around Niagara. I get to see the most amazing vineyards and orchards and I'm always awestruck by both their beauty and potential. And then every now and then I come across small abandoned orchards, single trees long forgotten, and something as simple as urban fruit trees here in St. Catharines. I'm always hit with how their potential isn't utilized and what can we do with it. Last summer, we hand-harvested about 500 pounds of apples from abandoned trees around Niagara and 50 pounds of crab apples from a front yard in St. Catharines, and decided to make a small-lot cider for them. We really went old-school on this one. The apples were all hand-milled (took about 19 hours total), pressed-off and then for fermentation we popped the lid off on old wine barrel and let the juice ferment naturally with whatever yeast was on the skins. After fermentation, we macerated all the crab apples and aged the cider on the crab apples for two months. What was in it for us on this project was tradition and respect. The tradition in creating a Niagara-styled scrumpy by hand all the way, the respect in taking fruit from trees that long ago were planted for purpose but had become forgotten and yet could still bring us something beautiful and delicious. What has the response been to Reclamation? Overall the reaction has been highly positive. We deliberately placed most of the cider into bars that deal in sour and wild beers so most of the people there got what we are up to with this one. Both Gavin and I were pretty stoked with how it turned out. Is this fruit something you plan to continue using? Since we released Reclamation numerous people have come forward to tell us of other abandoned trees or offer fruit from their yards. So the future looks bright to keep making it on a small scale for the near future. We’re also exploring other types of abandoned and wild fruit that we can play with as well. What role do you see GDC playing in food literacy? In some ways, we just view ourselves as a couple of dudes making ciders. But… I think it's pretty clear that this will become a larger part of who we are and what we want to do. For now, I would be pretty happy if even a couple people who hear the background of Reclamation take a second look at what’s around them and the amazing things that could be done with it. I really enjoy reading stories like that! I am so against any food waste! My father, in the Italian countryside, is always on the lookout foraging abandoned fruit trees, wild berries, mushrooms, greens. As for us, here in Edmonton, we have a crabapple tree in the backyard and last year I made applesauce out of some of them! The idea to make cider is wonderful! Great post. Good to see food being used in so many creative ways instead of waste. Another reason to visit Niagara. Good read! Growing up, my grandfather had a fair few fruit trees on his 4 acre Wainfleet property. I’d like to have at least a few one day; never considered this use for them! As someone who also grew his own grapes/made his own wine, he would have loved this as well! Amazing story, wonderfully told – loved it!